In support of the Texas A&M University Vision 2020: Creating a Culture of Excellence and Core Values, the Energy Action Plan (EAP) 2020 has been established as a follow-up to EAP 2015 – to continue improving the efficiency and effectiveness of mission-critical utilities and energy services. 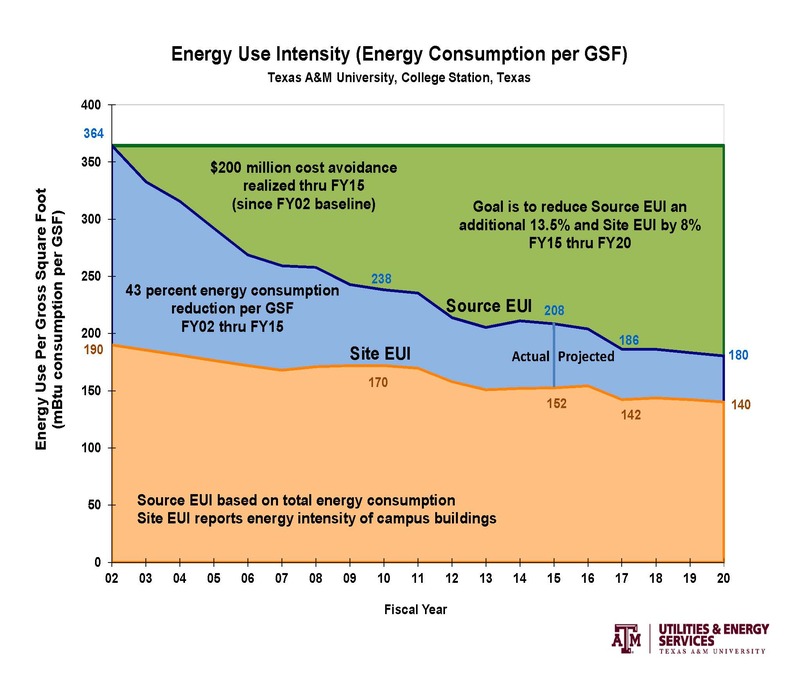 Energy efficiency can be expressed in terms of Source EUI, which includes all energy delivered to the campus or Site EUI, which only measures energy consumption and intensity of campus buildings – with both Source and Site measured in mBtu per GSF. Continuing upon energy efficiency improvement of 43 percent for Source EUI and 20 percent for Site EUI from FY02 through FY15, EAP 2020 has a goal to continue improving services while reducing Source EUI by an additional 13.5 percent (180 target) and Site EUI an additional 8 percent (140 target) for the period from FY15 through FY20. This goal is challenging but can be accomplished through effective implementation and management of the following comprehensive EAP 2020 plan. Read the entire Energy Action Plan 2020 here.